Suspected of assisting rebellion from abroad and later an aide to a well-known Confederate general, Charles James Faulkner was nevertheless able to make his way back to government work. Born in Martinsburg, Virginia in 1806, Faulkner graduated from Georgetown University in 1822 before studying law and being admitted to the bar in 1829. Three years later, he was elected to the Virginia house of delegates, where he served until 1834. While there, he proposed the gradual elimination of slavery by a measure that would declare all children born to slave parents after July 1, 1840 to be free. The proposal was voted down, and Faulkner fell more into the pro-slavery camp due to his opposition to Abolitionists in the North. 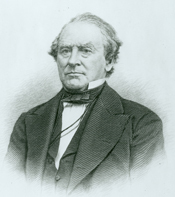 Faulkner was also a member of the state senate from 1841 until his resignation the next year, and returned to the house of delegates from 1848 to 1849. He was credited with introducing a bill that passed the house and formed the basis for the federal Fugitive Slave Law of 1850. In 1850, Faulkner was elected to Congress as a Whig. He joined the Democrats and was elected to another three terms, chairing the Committee on Military Affairs in his last term. One of Faulkner's biggest court cases, if perhaps one of his shortest-lived as well, was the representation of John Brown after the abolitionist's raid on Harper's Ferry in 1859. Faulkner and fellow attorney Lawson Botts were assigned to defend Brown, two of six lawyers who would take up the case before Brown's conviction. Faulkner immediately asked to be dismissed from the matter, saying he had been at the scene and heard the confessions of the raiders, that Brown did not approve of his appointment, and that he doubted the authority of the court to assign him. He still served in the role for one day before taking his leave. Also in 1859, Faulkner was appointed Minister of France by President James Buchanan. Buchanan had offered Faulkner the post after his election in 1856, but Faulkner declined out of deference to his friend John Y. Mason, who was already serving in the position. He accepted Buchanan's second offer, as it came upon Mason's death. While he was Minister, Faulkner was able to secure the right of expatriation for American citizens visiting the country. When the Civil War broke out in April of 1861, Faulkner found himself in a foreign country with his home state joining the Confederacy. Given his potential sympathy to the new government (a feeling shared by the French government), President Abraham Lincoln recalled Faulkner to replace him with William L. Dayton of New Jersey. Faulkner returned to the Washington, D.C. in August, intending to formally end his association with the government. There, he was arrested by order of the War Department. Faulkner was suspected of successfully negotiating arms sales to the Confederacy while in Paris, a charge the New York Times reported was substantiated by "conclusive evidence" that had arrived on another transatlantic steamer. He was also accused of planning to return to Virginia to take command of a contingent of rebels who had elected him colonel. Faulkner appealed to the War Department, but was rebuffed and told he was being held as a hostage to be exchanged for Pennsylvania state treasurer James McGraw, who had been captured after the First Battle of Bull Run while searching for a friend's body. Imprisoned at Fort Lafayette in New York Harbor, Faulkner was not released when McGraw was returned, but rather transferred to the custody of the Secretary of State. Now a political prisoner, he also changed prisons and was taken to Fort Warren in Boston Harbor. He refused to take an oath of allegiance to the Union, which would have led to his release. In a rather strange deal with Secretary of State William H. Seward, Faulkner agreed to a 30-day release in December to travel to the Confederate capital in Richmond, Virginia to negotiate his own exchange for Republican Congressman Alfred Ely of New York. Like McGraw, Ely had been captured while observing the First Battle of Bull Run. Faulkner was able to secure Ely's release and remained in Richmond, where he was cheered by a crowd of thousands. Ely later credited him with advocating the improvement of Confederate prison conditions based on Faulkner's own treatment in a Union lockup. Following his release, Faulkner joined the Confederate army and served as assistant adjutant general on the staff of General Thomas "Stonewall" Jackson. In a letter to a Jackson biographer in 1876, he says, "He was always equal to the position in which he was placed, whether it was in command of a regiment, a brigade, a division, or an army; and he could have with as much ease have handled 100,000 men upon the battlefield as he did 10,000." Accounts are mixed as to whether Faulkner stayed in the army after Jackson's death in 1863 or if he went to reside at his son-in-law's house at Appomattox. The matter is no doubt complicated by the fact that Faulkner's son, also a Charles J. Faulkner, served as an aide to two Confederate generals, including one who surrendered at Appomattox. Following the war, Faulkner made a visit to Washington, D.C. and said that he had been misrepresented by some newspapers, that he favored a union between the North and South and had joined Jackson's staff as a personal consideration for the Confederate officers instead of a political reason. For a short period after the war, little information is available on Faulkner. The ratification of the Fourteenth Amendment to the U.S. Constitution prohibited any person who had previously taken an oath of support for the Constitution as a member of the federal or state government from holding any government office if they had supported the Confederacy in the Civil War. Faulkner certainly qualified for this restriction. However, he soon returned to public life. In 1870, he was elected president of the Martinsburg and Potomac Railroad. In 1871, he was elected president of the Berkeley County Agricultural Society and also successfully defended the claims of the newly formed state West Virginia to Berkeley and Jefferson counties before the U.S. Supreme Court. He was a member of the West Virginia constitutional convention in 1872, the same year Congress voted to remove his Fourteenth Amendment disabilities. Faulkner was named a regent to West Virginia University, and the next year successfully ran for Congress. After one term, Faulkner opted not to run for re-election and returned to law work. He wasn't quite done with government; in 1876 he ran for the U.S. Senate and in 1880 he tried for the nomination for Governor of West Virginia, but was unsuccessful in both attempts. He died at his estate, "Boydville," in Martinsburg in 1884.